The Wavewalk S4 keeps changing people’s perception of both kayaks and car-top boats. Anglers, kayakers and boaters are learning that with this lightweight craft they can expect more, get more, and achieve more than they previously could, even if they owned several boats of different types and sizes, for fishing in different places. Texas is a big place that offers a wide variety of fisheries, both inland and in the ocean, and the S4 delivers high performance in all of them. The S4 does much more, and it does it better too. 4. 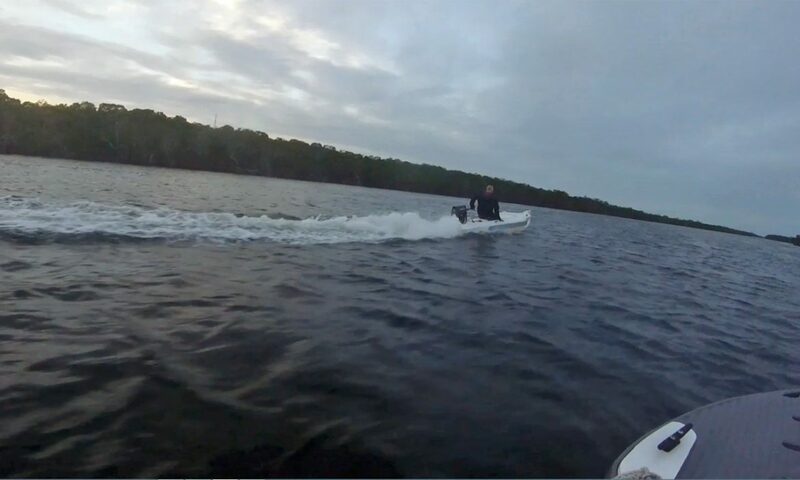 Comparison of the S4 powered by a 5 HP outboard motor to an S4 powered by a 9.8 HP motor – Both work perfectly, and provide a smooth and enjoyable ride, but the bigger and more powerful motor drives the S4 at a higher speed. Note that if you want your S4 to go faster, you’d need to outfit its motor with a high pitch propeller, and you may also want to consider outfitting the motor with a hydrofoil. Portable boat or fishing kayak? Portable boats offer one big advantage, which is that when you own one, you don’t have to use a trailer to store and transport it. In other words, after a long drive to the beach, you can put in without necessarily waiting in line at the boat ramp, together with other impatient and frustrated boaters like yourself. And when your fishing trip is done, you can simply take the boat out, without having to wait for others who where there before you. Traffic at boat ramps can definitely take too much time away from your fishing trip, and it can definitely take away some of the fun. Portability is important, but portable boats come with their own problems and limitations, and these have to do mainly with their size – Being of smaller size, these boats are neither stable nor comfortable, and their seaworthiness leaves much to be desired. Being boats and not paddle craft, they aren’t well fit for human propulsion, and paddling them across long distances is impossible. These limitations practically mean than portable boats don’t work well in moving water, such as in the ocean, and on the other hand, they don’t work well in very shallow water (skinny water) and weed infested water, since outboard motors’ performance in such waters is very limited. Fishing kayaks are considered by many as unworthy of being called boats because they are neither stable nor dry enough for fishing in the ocean, nor comfortable enough to fish anywhere, unless you’re a young, lightweight and physically fit person who suffers from no back problems at all. Another problem that fishing kayaks present is their being unfit for effective motorizing, namely with outboard motors, and this severely limits the user’s range of operation, and could even be a safety problem in fast currents, strong wind, and bad weather. For these reasons, few kayak fishermen venture in the ocean along the Texas coast. But what if there were portable boats that were seaworthy enough for fishing in the ocean, yet narrow enough to work perfectly as paddle craft, whether with canoe or kayak paddles? Such boats are the Wavewalk® 700 and Wavewalk® Series 4 (S4), patented twin-hull (catamaran) ultralight skiffs. Both boats are lightweight enough to be car-topped by one person, yet roomy and stable enough to take on board two large size anglers with all their fishing gear, plus an outboard motor. They can be launched pretty much everywhere, including rocky beaches nicknamed “rock gardens”. They can even be dragged across rough terrain. Both boats work well as paddle craft, with a crew of one (I.E. Solo) or two. In case the two passengers are not particularly heavy, the cockpits of these two boats are roomy enough to accommodate a third, small size passenger, such as a child or a dog, or both. The fact that these two boats work in either a canoeing or a kayaking mode allows their crew to fish the flats in very skinny water, as well as fish and hunt in marshes and other fisheries where vegetation abounds, and in non-motor zones (NMZ). This unique combination of seaworthiness and shallow water capabilities makes extremely well suitable to serve as skiffs for fishing the flats, bays and estuaries along the Texas coast. In fact the Series 4 (S) features the typical skiff stand up casting platform at the bow. The differences between the W700 and S4 is that the bigger S4 can carry a bigger payload and a more powerful outboard motor, while the narrower W700 works so well as a paddle craft that it’s easier and more comfortable to paddle than any canoe or fishing kayak, whether in a solo or a tandem mode. And this is where it’s important to say that both boats feature a saddle seat that’s similar to the seats that personal watercraft (PWC) a.k.a. Jet-skis feature, and they are totally back pain free (see this review »), which can’t be said about sit-in and SOT kayaks. So, whether you’re after redfish or tarpon, seatrout, mangrove snapper or bass, or any other saltwater or freshwater fish species, and whether you fly fish or hunt for ducks, solo or with a friend – these two boats offer you a higher level or freedom, comfort and versatility. Mud motor for kayak fishing the flats? Microskiff.us is a website dedicated to micro skiffs from Wavewalk.